This last weekend I took part in the global Ludum Dare 35 game jam. If you've been following me for awhile, you know I've participated in the past too. This time we made a game called Hexshaper--where the goal is to fly around, absorbing magic to seal portals to another dimension to prevent monsters from overtaking the world. The backstory, while not communicated directly, informed our design--but it wasn't like that at first. 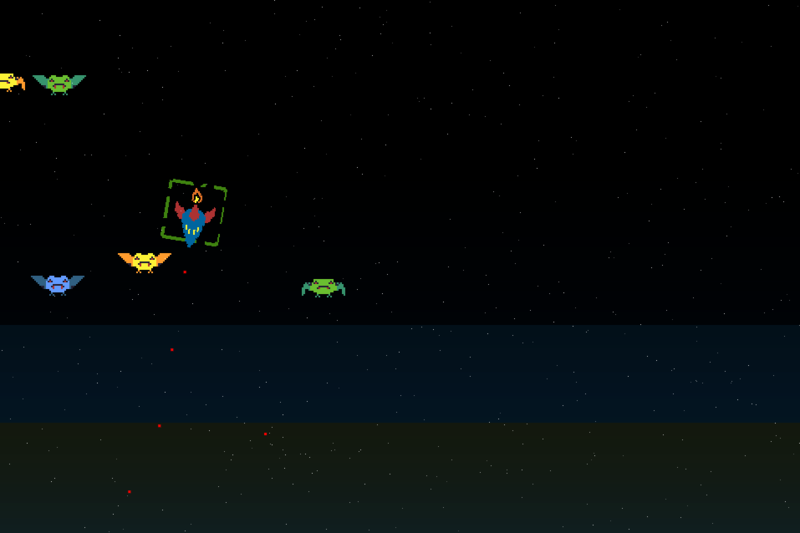 A ship shooting bullets at vampire bats in space? That is nothing like a witch flying around inside a castle closing portals! "Let's make an Ikaruga style shoot 'em up with enemies and levels"
"Let's have different kinds of shooting styles"
"Let's make different shields that absorb certain bullets"
"Let's do a Geometry Wars style arena shooter"
We ended up landing on the last two ideas Friday night but I don't think any of us really saw a coherent design in our heads. We knew the mechanics we wanted but that's about it. What was interesting about the game? Why are there vampire bats in space? Why are you shooting them? It feels wrong to constrain space, space is open and vast, why are you trapped? The problem was clear in hindsight and something that was nagging at me all throughout the day: we did not have an internally consistent idea. Our idea was too abstract and didn't tie together the reasons why the mechanics existed. There was no point of reference for the mechanics, the why of it all. Why were you a spaceship shooting bats in outer space? I don't know! None of us could explain why anything was happening. So as I drove home that night I was frustrated and afraid--we just spent the entire day working on a game but I have no idea to what end. It just didn't feel right. We had a spaceship, we had a space theme, how the heck could this make any sense? I felt like we designed ourselves into a corner. I find some of my best ideas, in game jams and outside of them, come when I give my brain time to think--driving home late at night, right before bed, etc. This is a pretty well-known phenomena and also why it's SO IMPORTANT to sleep during a game jam. Give your brain a rest. Your brain can pull together random stuff and tie it together when you push everything out and the time that usually can occur is before bed. When the team assembled, I told them I had a way to tie it all together--with minimal changes to existing mechanics. I was a little hesitant, would they like it? I was excited but started to doubt myself a little--was it a bit too farfetched? "OK, what if you're a witch or a wizard and you're trying to make some kind of crazy potion. But then your dumb assistant bumps the ingredients and they all fall and mix together, creating interdimensional portals! 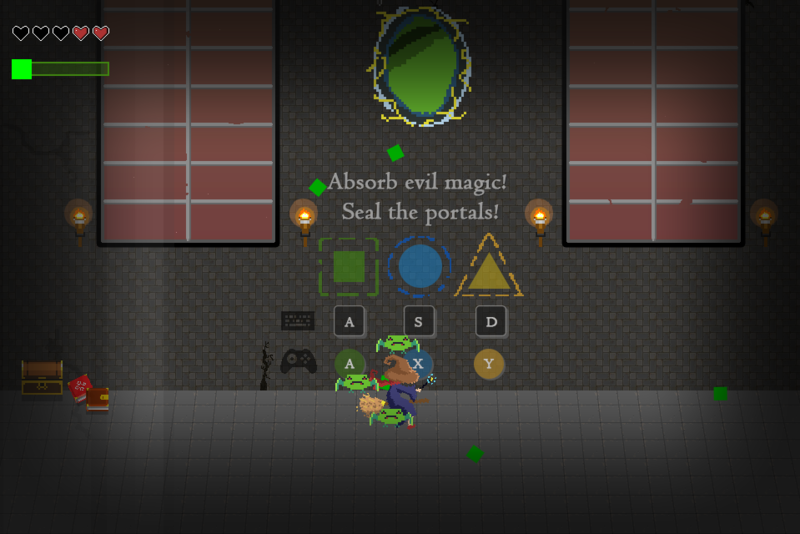 The potions correspond to the shield types and you are trying to close the portals by killing the monsters. The arena is closed because you're actually INSIDE on a broomstick and you're in a castle. So the goal is to close all the portals to save the world!" "What if the monsters and the portals are colored to show their association?" "What if we use shapes to denote the bullets and shield types?" "What if we did waves, so like the first wave introduces the player to the idea and then have more waves until you win?" You see, when you have an idea that is internally consistent you can answer all these kinds of questions easily and things just make sense. Why are you flying around? Because you're a witch! Why are their monsters? Because there are interdimensional portals! Why do you have a shield? They are hexes! How do you close portals? Absorb the magical energy to close them! Q: "Why are you shooting?" A: "I don't know, what if we get rid of shooting?" And sure enough when we did the game felt more natural--instead of shooting working against the primary mechanic of changing shields, now the only thing you can do is absorb magic and run into monsters. That felt much better! The new theme brought together the rest of the design ideas: you're in a castle, there are portals, it should be fantasy-themed, etc. It all just tied together nicely and all it took was re-skinning what we had Saturday night. Think of even the most basic game and try to find the theme--you'll see that the mechanics and design all play off each other, even if the theme is never communicated formally. This realization isn't anything new--I've read the Art of Game Design and many of the "lenses" discussed help you design a coherent theme. It's just something that can be hard to land on within 72 hours and easy to lose sight of in the excitement of a game jam. This experience also reinforces the value of focusing on the mechanics first rather than theming right away. One of the first things we did Saturday was design the spaceship! Instead, we should have focused on the mechanical ideas abstractly and then let the theme reveal itself. By using abstract design first, our minds could have been able to make connections faster to think of a consistent theme. When you're looking and playing with grey boxes, it becomes easier to imagine what the game might be like. When we decided to do art first, we pigeon-holed our brains into believing the final game needed to be space-themed rather than it being open-ended. If we had decided on a more consistent theme before we started development, we could have probably done even more by the end of the jam. When we designed Sweep Stacks, we knew exactly what the mechanics would be--so the theme was evident and we had scoped it to what we could finish in a jam. Sometimes what can help (and we didn't necessarily do this in this jam) is to write on a board the mechanics you want, then try to come up with creative ways they tie together. Don't spend too much time on one idea--someone should say let's move on and the group discusses a different idea entirely. This way, you can kind of avoid designing yourself into a corner by exploring all sorts of other ideas and how they relate to the mechanics you want. Only by a lucky burst of creativity, "Ship Shape" became Hexshaper and turned out to be even better than we first thought.